121. In a few seconds we will start the next leap. 122. We have reached our next goal, which is 1810 light years away from Earth. 123. You call the strange looking formation there, far out in space and 200 light years away, the Horsehead Nebula. As a long time board member of our society, I feel obliged to promote the scientific interest for astronomy in Switzerland. While I explicitly respect the ethical objectives of your community, I would politely like to advise you to look for a more honest compromise between ethics and scientific integrity which becomes apparent from some of the photomontages that you have privately brought into circulation. For the purpose of psychological protection of affected third parties, I would like to refrain from telling you the way we came to see those images for the time being. Until further notice, I promise you my own confidentiality, as I haven’t informed anyone but the 3 below mentioned recipients with copies and asked those 3 also to remain confidential. 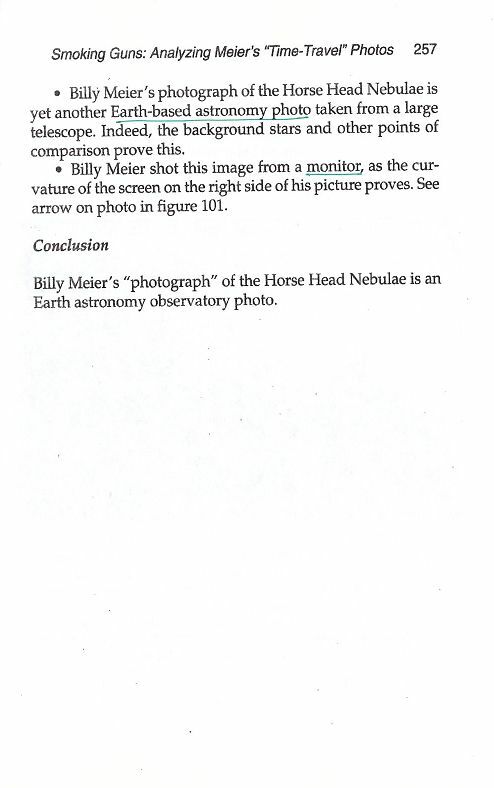 Astronomically it is easy to prove for at least 2 of your images (Pleiades and Horsehead Nebula) that the accompanying caption is not true when it says that they were taken close or relatively close by UFOnauts. You particularly forgot to retouch the foreground stars, which according to your version should have been on the side or behind the photographing UFOnauts. Also consider legally, that with your private montages you infringe a copyright, if this as I suspected belongs to our society. – About all this, I am only willing to have a possible telephonic conversation, if you first respond in writing. Your letter from November 22, ‘75 has delighted us much, even if the content showed more stupid, audacious and childish aspects as would be expected from a physics doctorate. As a person dedicated to reality, by the profession of a physicist, you should have considered, when you would think logically in this regard, that every matter should be examined and clarified unprejudiced, before untruthful allegations and even massive accusations are pronounced. Because false assertions and accusations are exactly what you have raised with your writing, without checking the facts at all, what one would actually have expected from a doctorate physicist in the first place. Therefore again think about it, that allegations and accusations are easily expressed and quickly lead to lies and slander, but that they are very difficult to correct again. With your professional position you should have figured that out yourself, what unfortunately hasn’t been the case. If you feel too exalted to get familiar with the matter about which you want to express accusations and assertions in a honest and correct way, then it is not our fault that we have to answer in this way. 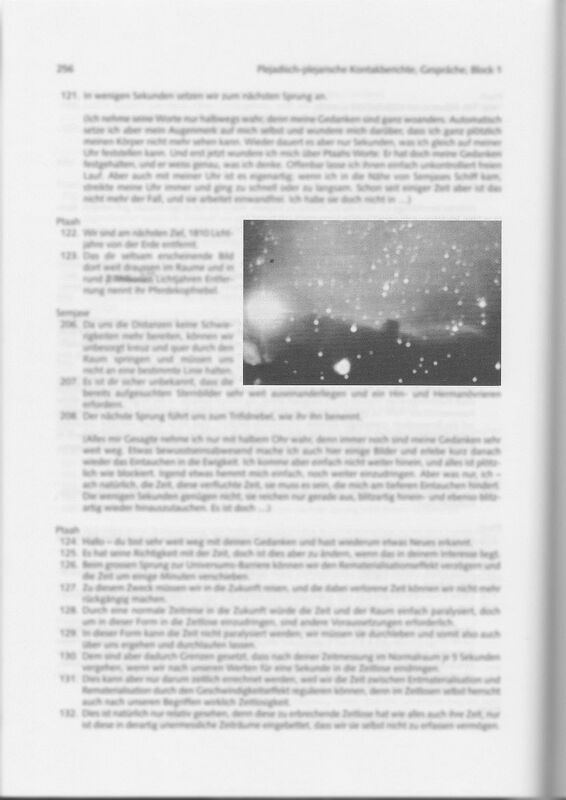 We are also very sorry that because of that the Swiss Astronomical Society is perhaps exposed in the sense that they have at least one member in their ranks who with regard to certain matters thinks and acts very unscientifically and incorrect. This brings us all the more sorrow, because otherwise the SAG very friendly and politely requested material from us to correctly get familiar with our case. This rejoices us even more, because it proves that at the SAG generally has members who boast great correctness and real scientific interests and efforts, and that in you are really only an isolated case who reacts in this way. This is really a great joy for us, because we adhere SAG, and we appreciate their work very highly. Therefore it’s the more regrettable that you apparently as an outsider joined this commendable society. If you believe, Mr. Locher, that you can oblige us with your somewhat megalomaniacal demand: “About all this, I am only willing to have any telephonic conversation, when you first reply in writing”, then you seriously cut yourself in your fingers. Firstly, we did not commit a mistake, but you did. And secondly it is completely inappropriate of you to play the great man, because the title of a doctorate physicist neither means that the person in question is a true human being, nor that he is elevated in consciousness regarding certain matters. We do not appreciate cockiness, also not from you. If you want to talk to us, you have no choice then to get of your ‘high horse’ and behave as a true human being. With us a man is not rated according to his title, but solely by his values as a human being. Therefore, we’re very sorry we could not get around mentioning the SAG as well as Mr. H. Rohr, P. Wild and R. Germann in connection to your stupid, brazen letter, because you have mentioned them in your letter. We are very sorry about that, because exactly the mentioned gentlemen we know as very correct and realistic people. We do not want to condemn you, Mr. Locher. It’s far from us to insult you. But your provocation made it necessary to answer you in this form. It is clear to us, that one should not simply accept or even believe everything without thought, because everything first requires a clarification. But this clarification should really happen, so no dumb, audacious letters like yours are written. If you want to make an effort, Mr. Locher, to fulfill the decency and correctness of real science, then we aren’t in anyway reluctant to talk to you and show you some material. However, please remember that we do not wish to be addressed as you try in your letter. You can be assured that we never let ourselves in with such megalomaniacal and stupid, brazen compulsory demands. If you want a discussion, it could only happen when you bother about human aspirations and renounce ostentatious demerits. Henceforth, for your stupid, brazen letters like you sent us, you should not use paper bearing the letterhead of SAG anymore, because your incorrectness and unscientific manner regarding the matters you complained about should not be associated with the SAG, because this truly commendable society and its members may be far beyond your personal grossness and degenerate machinations. You should really not defile this society and its correct thinking members by using the SAG paper, when you write such ill-considered letters. You’re absolutely free to look closely to our photo material and different original films as well as get insight in our extensive written material, of which you really could learn a lot. However, it is not enough that you only take a look to simply fulfill the necessary demand and then continue to make your accusations only to stand by your once expressed view. If you decide to do so, then we expect from you that you renounce your prejudices and superior attitude and really look at everything from a neutral point of view, and only then make a judgement. It would neither serve you or us, if you would bother about the case with prejudice. However we hope that you are so much a man that you are able to rid yourself from prejudices and also with respect to a committed mistake could correct yourself. It would be very good when you could do this, so afterwards you could form a judgement in order to avoid a reproach of the population of Switzerland that you undermine the scientific study of the stellar world, because just by your thoughtless use of SAG letterhead paper this almost irreparable harm could come to your society, what for your sake we try to prevent by all means, which is why we also state our position regarding your letter in this public form. 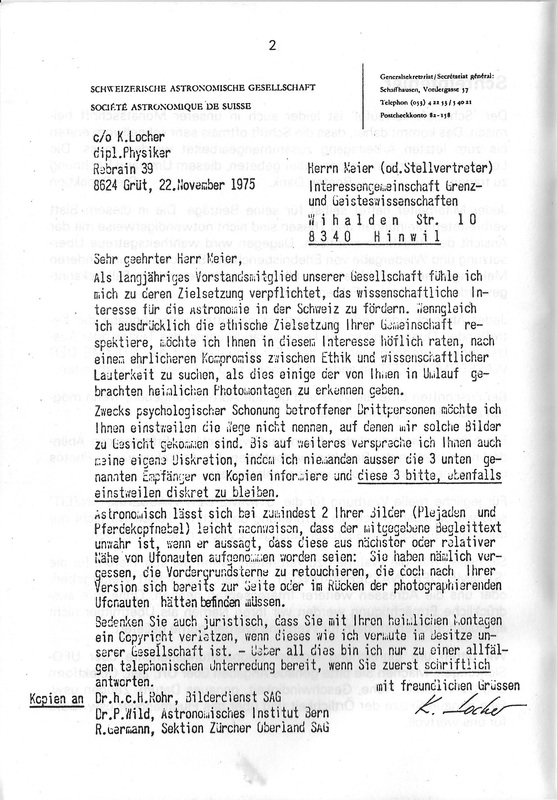 For this reason we like to attend the readers that the Swiss Astronomical Society hasn’t got something to do with the letter of Mr. Locher in any way and he alone is responsible for it. For our part, SAG and it’s other members are entirely beyond the stupid, brazen machinations of Mr. Locher, what should be very clearly understood by any person. The SAG and it’s members are in every respect known to us as very realistic, correct and commendable, so therefore they should not be drawn into a generalization, when the machinations of Mr. Locher are considered. Unfortunately there are always exceptions in any community, but the majority should not be held responsible for that. This should kindly be noted. The more pleasing it would be, when the exceptions would consider an improvement and would fit themselves into their community of their association or society, by which it would really be served. 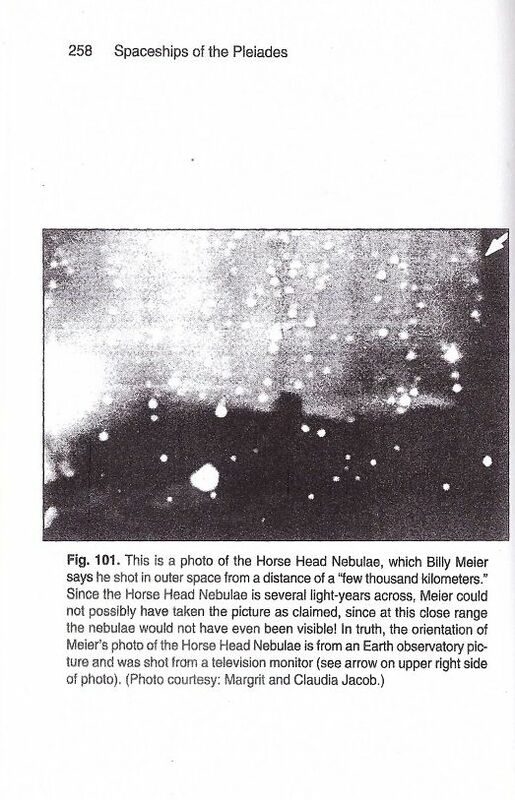 MUFON has received new information from reliable sources in Switzerland who have studied the Billy Meier photographs and other material (now in the book “UFO…Contact From the Pleiades”) since 1976. Genesis III/Wendelle Stevens publishes Message from the Pleiades Vol. 1 with English translations of the contact notes. 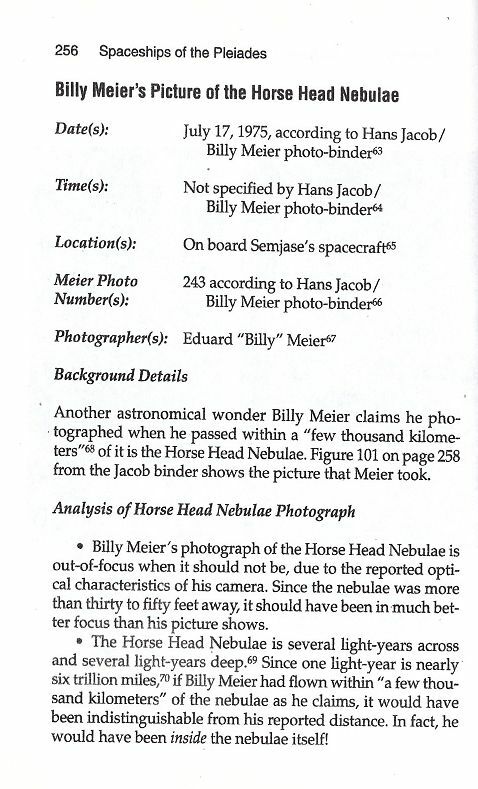 On page 338 he mentions that since some of Meier’s pictures of ‘stellar wonders’ were over exposed, out of focus, not reproduceable and contain other distortions, he was forced to collect Earth based observatory pictures to illustrate what he was trying to describe to others. These pictures, according to Stevens, eventually became confused by others as the pictures from the trip.